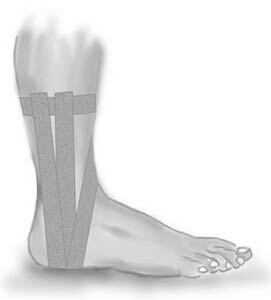 Application: The foot should be kept in a neutral position when applying the tape, at an angle of 90 degrees from the lower leg. One or two tape anchors are applied around the lower leg 10-20 cm above the ankle joint (A), followed by application of three stirrups. The stirrups are started from the anchor on the inner side of the leg if it is the outer tendons that are injured (95%), and the other way around in the rare cases where it is the inner tendons that are damaged. The stirrups are taken under the heel and drawn up to the anchor on the outer side of the leg. When applying the stirrups the outer border of the foot is pushed slightly up, whilst at the same time pulling the border slightly up with the tape. A stirrup (B) is applied with the rear half of the outer ankle knuckle directly under the tape. A sloping stirrup (D) starts from the anchor on the front side of the leg slanting down over the lower leg over the front half of the inner ankle knuckle, under the foot and over the front half of the outer ankle knuckle, and slanting in over the leg up to the anchor. Finish with a further strip on top of the anchor A.